Strip about 3/4 inch of insulation from each circuit wire (the ground wire may not be insulated), using wire strippers. Bend the bare end of the wire into a hook, or "U" shape, using needlenose pliers. Fit the hook of each wire over the appropriate screw terminal so that the end of the wire is on the right side of the screw. The wire insulation should be close to—but not under—the screw; only the bare metal of the wire should contact any part of the screw. Close the hook snugly around the shank of the screw, using needlenose pliers. Tighten the screw clockwise, using a Phillips screwdriver. Because the hook is wrapped clockwise around the screw, tightening the screw closes the hook even more. The screw should be very tight, holding the wire firmly below the screw head. When an outlet receptacle is located in the middle of a circuit run—with other receptacles "upstream" and additional receptacles "downstream"—there are two ways to wire the receptacle. First, you can wire the receptacle so the incoming wires connect to one pair of hot and neutral screw terminals on the receptacle, and the outgoing wires connect to the other pair of screw terminals. In this configuration, all power for the circuit runs through the metal linkage within the receptacle itself. This makes for fairly easy connections, but its drawback is that if anything goes wrong with the receptacle, the downstream portion of the circuit also goes dead, since no current can flow through the receptacle. For this reason, pros usually wire receptacles using the second method, if possible. The second method of wiring middle-of-run receptacles is to connect them to the circuit wires via "pigtails." A pigtail is a short length of wire that runs from a hot or neutral screw terminal on the receptacle to the circuit wires, which are joined together in the outlet box with a wire connector. In this configuration, there is a complete pathway running through the electrical box to the downstream portion of the circuit; the pigtails simply tap into the hot and neutral lines to feed the receptacle. The advantage of this configuration is clear: If the receptacle goes bad, there is still an unbroken circuit pathway leading to outlets and fixtures downstream of the receptacle. Most electricians will use this second configuration where the box has ample room to fit the wire connectors. Polarity is part of a safety system that keeps the electricity flowing in the proper direction. In a typical household electrical circuit, the black circuit wires (and sometimes red) are the "hot" wires that carry power from the source to the switch or receptacle. The white wires are "neutral" and carry the electricity back to the home's service panel (breaker box) after it flows through all of the devices or fixtures in the circuit. To maintain proper polarity when wiring a receptacle, connect the black hot wire to one of the hot bronze-colored terminals. Connect the white neutral wire to one of the neutral silver-colored terminals. When wiring standard switches, the wires connected to the switch are both hot wires. If neutral wires are present in the electrical box, they are simply joined together with a wire connector, bypassing the switch. 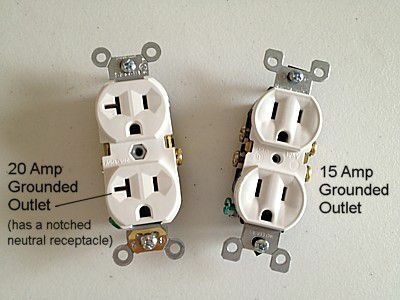 With all switches and receptacles, connect the circuit's ground wire (bare copper or with green insulation) to the device's ground screw. Many switches and receptacles have holes in the back of the device's body for making "stab-in" connections. The stripped end of the wire is inserted into the hole, and a spring clip inside the hole holds the wire in place. High-quality devices have screws that can be tightened down after inserting the wire for a stab-in connection. These devices provide a secure connection and are acceptable to use. Cheap devices often don't have these screws, and the connection relies entirely on the spring tension inside the hole. For this reason, this type of connection is not recommended. If a device has no screws for clamping the stab-in connections, use the standard side screw terminals instead of the stab-in connections. Three-way switches control a light fixture or outlet from two different locations. These switches have two "traveler" wires and a single "common" wire. The trick to replacing a three-way switch is to mark the common (or "COM") wire on the old switch before removing the wires. The traveler wires don't need to be labeled because either traveler wire can connect to either traveler screw terminal on the switch. To wire the new switch, connect the labeled common wire to the COM terminal (usually bronze or dark-colored) on the switch. Connect each of the other two wires to one of the light-colored traveler terminals. If you want the receptacle to provide GFCI protection to the device(s) downstream of the receptacle, use both the LINE and LOAD terminals, following the manufacturer's wiring diagram. If you don't need to provide GFCI protection for other devices, or if the receptacle is at the end of the circuit (end-of-run), use only the LINE terminals, following the manufacturer's wiring diagram. If this receptacle is a middle-of-the run receptacle, use short pigtail wires to link the circuit wires to the LINE terminals on the receptacle. What Are Isolated Ground Receptacles?